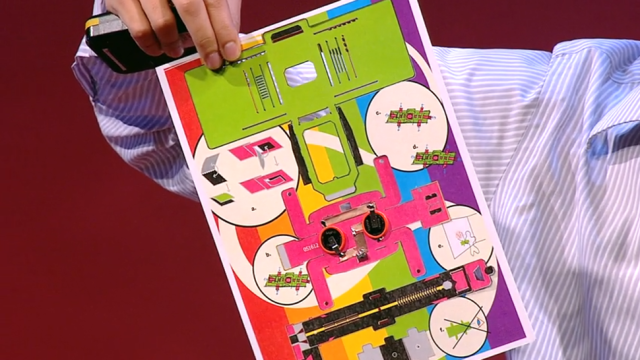 Researchers at Stanford have designed a foldable microscope out of paper. When I first saw this I didn’t think a cheap paper microscope could actually be of any use, turns out these things can magnify up to 2,000x. Which is what scientific microscopes usually do. The purpose of this cheap microscope is to make it easier to diagnose malaria. Especially in places where hospitals can’t afford ‘real’ microscopes this is going to be a huge life saver, as explained in the video. But this is clearly also a great step towards popularizing science, even schools in third world countries can afford one of these. An outline of the parts that make up the body of the microscope can be printed on card stock and then punched out. The additional parts include a lens, an LED for illumination and a button battery like the ones used to power a digital watch. An individual scope can be made in different configurations for different purposes. Using certain colored LEDs for example, turns it into a fluorescent microscope capable of visualizing specific proteins or other biomolecules labeled with fluorescent dyes. The microscopes can run for up to 50 hours on a single battery. They’re tough too. They can withstand being dropped or even stepped on. Eventually, of course, people are going to find ways to break their clever microscopes. But at a dollar apiece for the most expensive, high magnification version, it’s not the end of the world. Print out another sheet, fold it up, and you’re back in business. 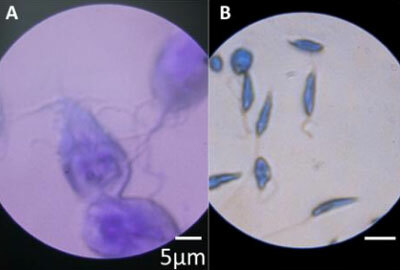 Two disease-causing microbes, Giardia lamblia (left) and Leishmania donovani (right), as seen through the folding microscope.